Sometimes you just end up in the right place at the right time. 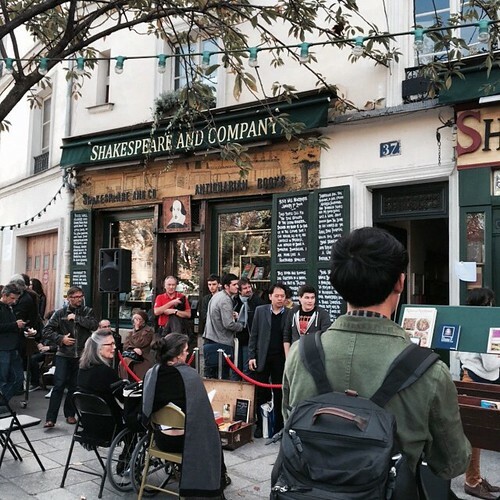 On our last day in Paris I wanted to see the Shakespeare and Company bookstore. Several friends who had been to Paris said it was a must-see for a book lover like myself. That’s right. 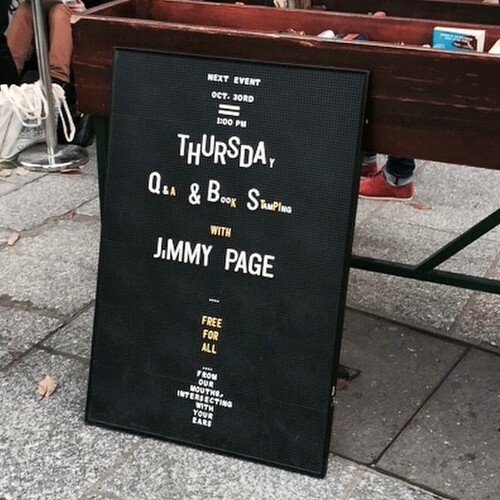 Jimmy Page was going to be there at 1:00 p.m. and it just happened to be about 12:30. Needless to say, we joined the queue. The Q&A took place in one of the small rooms in the bookstore and we just missed making the cut-off. But we were escorted to another room where the session was piped in via speaker. 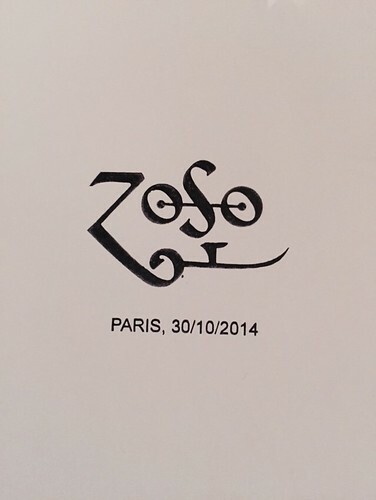 After we were seated in there, along with about 20 other people, they escorted Jimmy Page through to our room where the Q&A was held. He walked within about 3 feet of us. The session was very interesting and when it was over we joined the line to get a copy of his new autobiography stamped. We had all been told in advance that no photos were allowed and that he wouldn’t be shaking hands. I assumed that meant he was not going to be very friendly but I couldn’t have been more wrong. He was seated at a table with an assistant on either side of him. 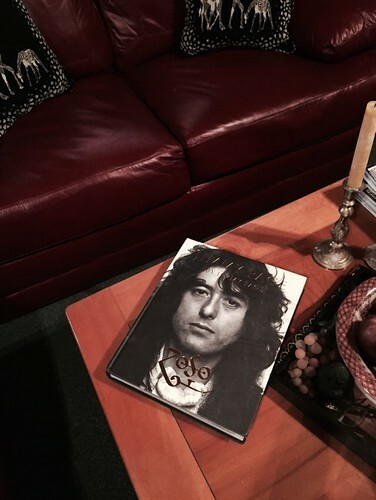 The first one opened our book to the correct page and placed it in front of Jimmy. He then smiled at me, extended his hand and thanked me for coming. He took almost half a minute very, very carefully positioning the stamp. The other assistant then placed a sheet of blotting paper over it, closed the book and handed it to me. Jimmy then offered his hand again, both to me and to David. He was as nice as could be. I’m pretty sure that was the highlight of our trip as far as David was concerned. And I have to admit, I thought it was pretty cool, too. This picture doesn’t quite capture how huge the book is but let’s just say that by the time David had carried it through the airports in his backpack on our way home he was glad we had only bought one copy. Oh, and on our way out I was interviewed on camera. I have no idea what it was for and since I didn’t have anything especially witty to say that’s probably just as well.